GATTY, JULIANA HORATIA (Ewing), author; b. 3 Aug. 1841 at Ecclesfield (South Yorkshire), England, daughter of Alfred Gatty, the vicar of Ecclesfield, and Margaret Scott, a well-known children’s writer; m. 1 June 1867 Alexander Ewing, and they had no children; d. 13 May 1885 at Bath and was buried at Trull, near Taunton, England. Juliana Horatia Gatty was educated at home, as were her three sisters. Stories by Hans Christian Andersen, the brothers Grimm, and Frederick Marryat were among those read and remembered by the Gatty children. Juliana’s nickname, “Aunt Judy,” given to her by her brothers and sisters because of a talent for story-telling and mimicry, was used by her mother in the titles of both her popular book, Aunt Judy’s tales (1858), and the children’s monthly she established in May 1866, Aunt Judy’s Magazine. As well as acting as the family story-teller, Juliana promoted family theatricals and presided over their imaginative games. Juliana’s earliest literary involvement was as the editor and “principal contributor” to an unpublished family magazine; it continued from 1856 until the early 1870s under various titles but was known mainly as “The Gunpowder Plot Magazine.” Her first published story, “A bit of green,” appeared in Charlotte Mary Yonge’s Monthly Packet in July 1861; it was also one of the stories in her first book, Melchior’s dream and other tales (1862), illustrated by her elder sister and edited by her mother. Most of her subsequent stories and verses were to appear first in Aunt Judy’s Magazine. Shortly after her marriage on 1 June 1867, Juliana Horatia Ewing, as her name would appear on future literary efforts, sailed for Canada with her husband. 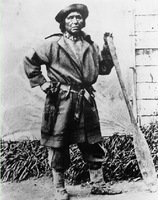 Major Ewing, attached to the 22nd Foot, was posted in Fredericton where the couple remained until their return to England in October 1869. It is clear in her many letters home that, although occasionally homesick, Juliana enjoyed her life in Fredericton, where she lived initially in a large home she named Reka Dom, meaning “house by the river.” She reports in a letter her husband’s delight in discovering that Fredericton was at about the same latitude as the garden of Eden and one gathers that it became a kind of Eden for them in the first two years of married life. Mrs Ewing was fascinated by Canadian flora and fauna, planted a garden, painted water-colours of New Brunswick scenes, learned to canoe on the river and to snow-shoe on the surrounding hills, studied Hebrew with Bishop John Medley*, attended the nearby cathedral, and became acquainted with the local Malecite Indians, as well as collecting their handicrafts. While in Canada she continued to write. In September 1867 Aunt Judy’s Magazine published “An idyll of the wood” which contained a description of the New World: “A country of pine woods was near; and light was in sight . . . . Not home, but yet a land of wondrous summer beauty.” In December of that year “Three Christmas trees,” set “in the small town of a distant colony,” appeared in the same magazine. Mrs. Overtheway’s remembrances (1869), often considered her best book, was originally published in Aunt Judy’s Magazine and the final two of its four parts were completed while she was in Fredericton. The third part ran in the journal from June to October 1868 with the name of her house Reka Dom as the title; the fourth part, “Kerguelen’s Land,” inspired by a book belonging to Bishop Medley, also appeared in the October 1868 issue. Some of her works written after her return to England in 1869 reflect experiences in Canada. Indigenous flowers such as the trillium and jack-in-the-pulpit are mentioned in stories, and she included descriptions of several dogs she had in Canada, of which she was very fond. A poem, “Canada home,” appeared in Aunt Judy’s Magazine in 1879 and in the 1895 edition of Verses for children. It was published again, along with a memoir of Mrs Ewing, eight of her Canadian water-colours, and 22 of her letters from Fredericton, in Leaves from Juliana Horatia Ewing’s “Canada home” (1896). After her return to England Juliana had not only continued her work as an author but had also briefly become involved in the editing of Aunt Judy’s Magazine. 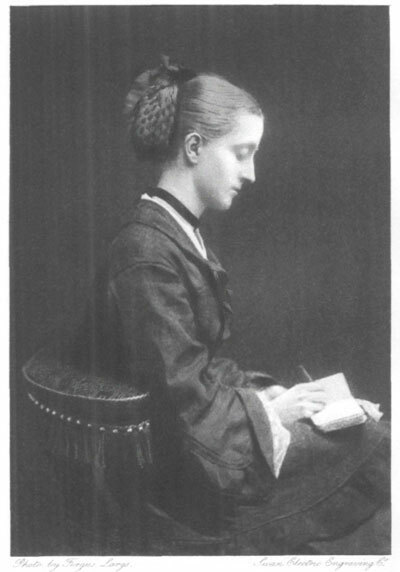 When her mother died in 1873, she and her sister, Horatia Katharine Frances Eden, continued the journal; after two years Juliana withdrew and her sister carried on alone until 1885, the year in which Juliana, her most important contributor, died. In the final decade of her life, although plagued by delicate health, Juliana had managed to publish books almost at a rate of one each year. Six to sixteen (1876) was remembered by Rudyard Kipling in his autobiography: “I owe more in circuitous ways to that tale than I can tell. I knew it, as I know it still, almost by heart.” In 1877 she dedicated A great emergency to Bishop Medley and his wife “in pleasant and grateful memory of New Brunswick.” Henry James called Jackanapes (1884) “a genuine little masterpiece, a wonderful little mixture of nature and art.” Some of her other well-known works are Lob Lie-by-the-fire (1874), Jan of the windmill (1876), The story of a short life (1885), and a posthumously published collection, Verses for children (1888). An authorized version of her works appeared in 18 volumes from 1894 to 1896. Juliana Horatia Ewing’s writing was marked by genuine human feeling. Her greatest strengths were her ability to convey the normal pleasures of childhood in an unaffected, unpatronizing manner; her gift for detailed, accurate description of country life; her gentle, lightly ironic humour; and her simple, practical common sense and piety. Her stories may have the manner of the Victorian era, but they have a permanent place in the history of children’s literature. J. H. Gatty (Ewing) was the author of “A bit of green,” Monthly Packet (London), 22 (July–December 1861): 80–91; Melchior’s dream and other tales, ed. Mrs Alfred Gatty [Margaret Scott] (London, 1862); “An idyll of the wood,” Aunt Judy’s Christmas volume for young people (London), 3 (May–October 1867): 257–66; “Three Christmas trees,” Aunt Judy’s May-Day volume for young people (London), 4 (November 1867–April 1868): 80–88; “Mrs. Overtheway’s remembrances,” Aunt Judy’s Christmas volume for young people, 5 (May–October 1868): 67–74, 162–67, 195–206, 259–75, 323–47; Mrs. Overtheway’s remembrances (London, 1869); Lob Lie-by-the-fire, or the luck of Lingborough; and other tales (London, 1874); Jan of the windmill; a story of the plains (London, 1876); Six to sixteen: a story for girls (London, 1876); A great emergency, and other tales (London, 1877); Jackanapes (London and New York, 1884); The story of a short life (London, ); Verses for children and songs for music (London, 1888; enlarged ed., London and New York, ); [Works] (18v., London, 1894–96). Leaves from Juliana Horatia Ewing’s “Canada home,” comp. E. S. Tucker (Boston, 1896), was also published. For more complete lists of her works see: British Museum general catalogue; National union catalog; The Osborne collection of early children’s books, –1910: a catalogue, comp. Judith St John (2v., Toronto, 1958–75); H. K. F. [Gatty] Eden, Juliana Horatia Ewing and her books (London and New York, 1885). G. [E.] Avery, Mrs Ewing (London, 1961). Marghanita Laski, Mrs. Ewing, Mrs. Molesworth and Mrs. Hodgson Burnett (London, 1950). Christabel Maxwell, Mrs Gatty and Mrs Ewing (London, 1949). [M. O.] Oliphant et al., Women novelists of Queen Victoria’s reign: a book of appreciations (London, 1897), 298–312. A. I. Hazeltine, “Aunt Judy: Mrs. Gatty and Mrs. Ewing,” Horn Book Magazine (Boston), 16 (1940): 320–30, 457–66. “Juliana Ewing’s world: morality with fun; interpreter of Victorian childhood,” Times Literary Supplement (London), 9 Aug. 1941: 380. Marjorie Thompson, “Mrs. Ewing in Fredericton,” Atlantic Advocate (Fredericton), 55 (1964–65), no.6: 38–42. Desmond Pacey with additions by Judith St. John, “GATTY, JULIANA HORATIA,” in Dictionary of Canadian Biography, vol. 11, University of Toronto/Université Laval, 2003–, accessed April 24, 2019, http://www.biographi.ca/en/bio/gatty_juliana_horatia_11E.html.